Posted February 24, 2010. Filed under Addons. Tags: IDE. Komodo is a cross-platform IDE that supports Python. It comes in a free and commercial version. This article describes how to configure Komodo to run Vizard scripts. 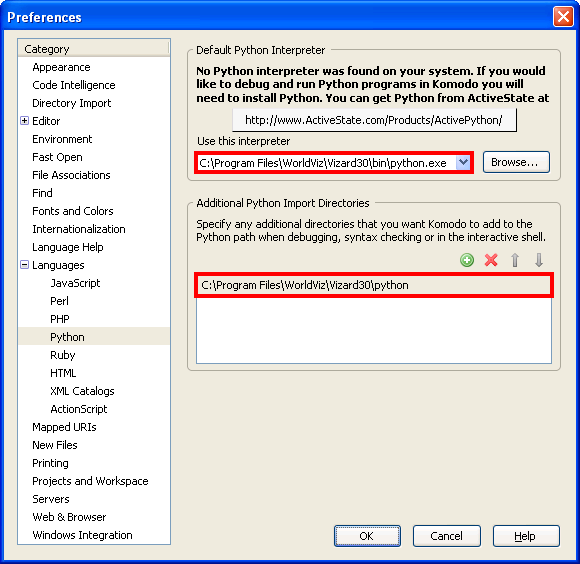 Download and install Komodo IDE (commercial) or Komodo Edit (free). Use the "Run Command" feature in order to launch scripts using Vizard by going to Tools > Run Command. The run command should be the path to the winviz.exe file in your Vizard bin directory followed by "%F". For example, "C:\Program Files\WorldViz\Vizard30\bin\winviz.exe" "%F". Be sure to check the Add to Toolbox option to save the Run Command for future use. When you click Run, the current script will be launched using Vizard. The Vizard run command will also be saved in the Komodo Toolbox pane. If you right-click the Vizard run command within the toolbox and go to the properties, you have the option of assigning a keyboard shortcut to the Vizard run command.